After more than 30 years of riding the highways of America and elsewhere and a year full of tragedy and trial, Jacksonville Florida's Molly Hatchet release a defining album that stands as a kind of Southern rock mission statement. 2004 saw the sudden and tragic departure of Stephanie Ingram, wife of guitarist Bobby Ingram who was such an important part of Molly Hatchet behind the scenes. And then in March 2005, the man who for many was the voice of Molly Hatchet, Danny Joe Brown, passed away after a long battle with diabetes. Such times will put the strongest of rock bands to a stern test. Not only has Molly Hatchet failed to fold up their tent and head out to pasture, but with "Warriors of the Rainbow Bridge", they have put out one of the hardest rocking slabs of Southern fried rock ever. This one really hails back to the days of their debut record and "Flirtin' With Disaster". There's not any experimentation or needless introspection going on here...it's just killer Southern boogie with a strong metal flavor that will get every gator in the swamp grinning and thrashing his tail. If you were ever a fan of this band in the past, you owe it to yourself to pick up "Warriors of the Rainbow Bridge". If you've never heard them before, now's the perfect time to grab a bottle of Jim Beam, kick the dirt off your boots and wave the Confederate flag with these redoubtable Sons of the South. This will be a sure live favorite and future Molly Hatchet anthem. Beginning with a simmering build-up, it unfolds a mid-tempo tune heavy on the guitar crunch. Phil McCormack has that thick Southern voice that's definitely in the mode of the late Danny Joe Brown. This is a celebration of sweet potato pie and cranking Southern rock, complete with raging guitar solos and female vocals on the chorus. In contrast to its rather romantic title, this tune really kicks things up a notch with a driving, heavy tune that almost reminds me of Saxon with a swampy touch to it. 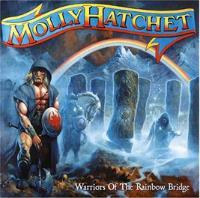 Really, Molly Hatchet is kind of an oldschool metal band with a Southern twist and this song reinforces that. This has a funky, punch riff that feels really familiar but sinks in really deep. It's one of the catchiest cuts on the whole album. The chorus with its sassy backing female vocals will stick in your head like okra seeds in your teeth! I love that cool twirling guitar riff that kicks this off...that's pure Southern rock, a uniquely American sound. It soon turns into more pounding bluesy boogie not too different from "Roadhouse Boogie", complete with a folksy chorus that advises "Don't let the screen door hit ya/Where the Good Lord Split ya". There's some nice honky-piano on this one, too, which makes a break from the usual screaming axe solos. This is a slower, more serious song with a kind of melancholy feel to it. The verse riffing is pure AC/DC but the chorus has that more serious feel with strong backing vocals. Burly power chords start this off but soon turn into a mellow country flavored verse, the most purely "pretty" part of the album. It reminds me a little of the Marshall Tucker Band. But soon enough, the guitar comes crunching back in and the pace picks up quite a bit by the end of the song. The lyrics seem to be inspired by the band's recent rise above adversity. This sounds kind of like a heavy metal hoedown at the start. The familiarity factor starts to take its toll here, as the song really sounds too much like the previous "Roadhouse Boogie" and "Time Keeps Slipping Away". Though I'd say it's one of the lesser tracks, it's still not what I'd call "bad." This fast paced scorcher is the album's hellraiser. Again, I really hear shades of Saxon in this one, merged with Molly's trademark Southern sound and John Galvin's honky tonk piano hovering around the background. Wow, this one starts with riffing that reminds me of a heavy, boogie-based "With A Little Help From My Friends", but soon it turns into a real gritty roadhouse number with a classic Southern rock feel. The flaw here is that the song goes just a little bit too long. This cut is as heavy as hell and shows the hardest side of Molly Hatchet. It's not that fast but the slow riff matches the heaviest of old Sabbath or Ted Nugent. There's a familiarity about the tune but that doesn't stop it from being a prime example of the tougher side of Southern rock. It's a tradition to end most Southern rock albums with an epic cut full of emotion and screaming guitar solos. This is one of the finest I've heard in a long time, maybe since Molly's own "Fall of the Peacemakers". It's a tribute to guitarist Bobby Ingram's late wife Stephanie and you can feel the emotion flowing through the slow, almost majestic opening part of the record. The second half of the song cuts loose with some superb dueling guitar solos trading off over some very heavy riffs. There's a true feeling of melodic power here that many metal bands would have a hard time reaching. 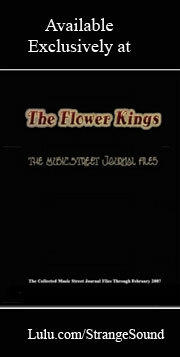 It's a great song and a fitting tribute not only to Stephanie and Danny Joe, but Southern rock itself.